Archaeologists working near Redmond Town Center have unearthed stone tools crafted at least 10,000 years ago by some of the region’s earliest inhabitants. The project started off as nothing special — just a standard archaeological survey to clear the way for construction. But it quickly became clear that the site near Redmond Town Center mall was anything but ordinary. 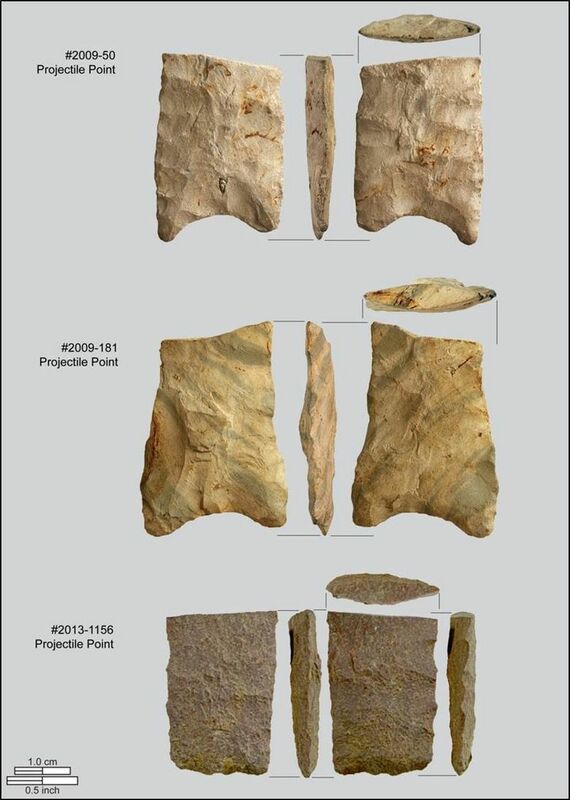 By the time excavations were done, crews had unearthed more than 4,000 stone flakes, scrapers, awls and spear points crafted at least 10,000 years ago by some of the region’s earliest inhabitants. The discovery is yielding new insights into the period when the last ice age was drawing to a close and prehistoric bison and mammoths still roamed what is now Western Washington. The site on the shores of Bear Creek, a tributary to the Sammamish River, appears to have been occupied by small groups of people who were making and repairing stone tools, said Kopperl, of SWCA Environmental Consultants. Chemical analysis of one of the tools revealed traces of the food they were eating, including bison, deer, bear, sheep and salmon. The site was initially surveyed in 2009, as the city of Redmond embarked on an $11 million project to restore salmon habitat in Bear Creek, which had been confined to a rock-lined channel decades before. The work was funded largely by the Washington State Department of Transportation, as a way to mitigate some of the environmental impacts of building the new Highway 520 floating bridge over Lake Washington and widening the roadway. The first discoveries were an unremarkable assortment of artifacts near the surface, Kopperl explained. But when the crews dug deeper, they found a foot-thick layer of peat. Radiocarbon analysis showed that the peat, the remains of an ancient bog, was at least 10,000 years old. That’s when things got exciting. As they delved below the peat in subsequent field seasons, the crews started finding a wealth of tools and fragments. Because of the artifacts’ position below the peat, which had not been disturbed, it’s clear they predate the formation of the peat, Kopperl explained. Radiocarbon analysis of charcoal fragments found with the tools confirm the age. Only a handful of archaeological sites dating back 10,000 years or more have been discovered in Western Washington. They include 12,000-year-old mastodon bones near Sequim and prehistoric bison remains on Orcas Island from about the same time period. But neither site yielded stone tools. “It’s hard to find this kind of site west of the Cascades, because it’s so heavily vegetated and the Puget Lobe of the big ice sheet really affected the landscape,” Kopperl said. A handful of sites have been discovered east of the mountains with tools dating back between 12,000 and 14,000 years. So it’s clear that humans have lived in the area since soon after the glaciers retreated, but a lot of mystery still surrounds the region’s earliest occupants and their origins. By 10,000 years ago, the ice that covered the Redmond area was long gone, leaving Lake Sammamish in its wake. But the lake’s marshy fringes extended much farther than they do today, Kopperl said. Pine forests were dominant instead of the firs that are now so common. 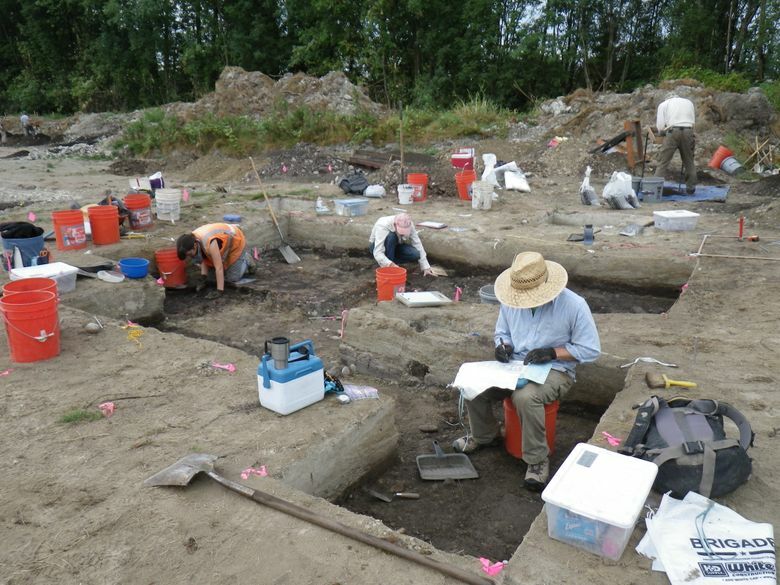 Excavations in the 1960s at what is now Marymoor Park, just south of Bear Creek, revealed abundant evidence of people living there about 5,000 years ago. In fact, most of the region’s streams and waterways were probably occupied or used by early Native Americans — just as they were later used by white settlers and today’s residents, Brooks said. “It just shows you that humans continuously use the landscape, and that the places that people use today are the same places that people used yesterday,” she said. Among the most unusual artifacts from the Bear Creek site are the bottoms of two spear points. The points don’t display the graceful fluting characteristic of what’s called the Clovis method of toolmaking. Instead, they have concave bases, which has only rarely been seen. So perhaps the tools represent an earlier style that’s still not well understood, Kopperl said. While great for archaeology, the serendipitous discovery at Bear Creek added to the cost of the restoration and delayed the project’s completion by about two years, said Roger Dane, of the city’s natural resources division. Officials worked with the Muckleshoot and Snoqualmie tribes, whose ancestors might have been among the actual toolmakers, to ensure that the site is permanently protected, Dane explained. The goal of the restoration was to return the creek to a meandering bed and add vegetation, woody debris and shallow areas to make it more hospitable for salmon. “For a creek that runs through an urban area, it’s one of the more productive salmon streams in the area,” Dane said. When Kopperl and his team are done analyzing the artifacts, they’ll hand them over to the Muckleshoot Tribe for curation. There are no immediate plans to display the artifacts publicly. Construction at the site was completed this year, including addition of a thick cap of soil and vegetation over unexcavated portions to protect and preserve remaining artifacts. Signs explaining the restoration and the site’s archaeological significance will be added next year. The excavation also uncovered a single fragment of salmon bone, testament to the fact that the Northwest’s iconic fish has made its way up local streams for at least 10,000 years.